Area X-10 is the tenth course of Secret Storage, the one hundred third course overall in Mario vs. Donkey Kong: Mini-Land Mayhem!, and the final course of the game. The level features six Mini Marios, though not necessarily in the same starting positions. 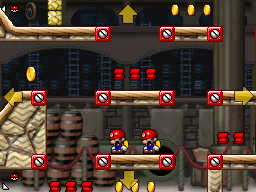 The Mini Marios all begin in groups of two at the bottom left, top left, and very center, respectively, with the exit door at the bottom right. In order to reach it, they must simply be guided via a series of Red Girders, Girder Pickups, and Warp Pipes to it. The M-Token is located near the top right, at the bottom of a slope and near some Crumble Blocks. To collect it, a group of Mini Marios must enter the azure Warp Pipe from the bottom and slide down to it. The Mini Mario Card is located near the bottom left, just above the bottom left group of Mini Marios. There are a multitude of ways to reach it, such as using a Red Girder platform upon exiting the bottom yellow Warp Pipe or by sliding down the center slope and drawing a Red Girder slope to it. In order to earn a trophy, the player must score 13700 points. In Plus Mode, the two Mini Marios must be guided to the exit door first, followed by the Mini Toad, then the Mini Peach, then the Mini Donkey Kong, then finally the Mini Pauline. In order to earn a trophy, the player must score 11700 points. This page was last edited on September 18, 2018, at 06:44.